A Programmable Logic Controller (PLC) is a general purpose control that processes analog (temperature) and discrete inputs (such as pressure switch and motor overload) to sequence outputs (such as compressors and hot gas bypass valves). They are in widespread use in both simple machinery and complex production lines. Their appeal is their flexible configuration and field programmability. They are easily networked to provide complete plant-wide information management systems. 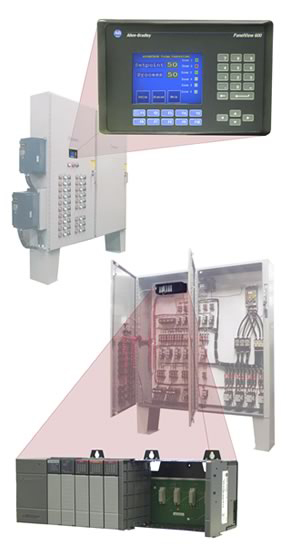 PLC controls can be optionally used to replace the Advantage Multizone III chiller control. The PLC will sequence the compressors, valves and pumps in the same way the MZC III does. The information in the PLC can also be shared with other PLCs and data collection monitors in a plant or cell network. The use of the PLC allows the control logic of the chiller system to be altered in the field. The PLC can be programmed to process information and make control decisions based on this information. The hardware used in PLC controllers consist of input and output modules for receiving and sending various signals, an information processor (CPU) and an operator interface panel. Input and output modules are added to meet the specific requirement of the system to be controlled. A variety of operator interface panels are available from basic 2 line black and white text displays to color touch screen displays. There are many manufacturers of PLC hardware, including Allen Bradley (SLC-500), General Electric (90-30), Siemans, Square D (Modikon) and others. PLCs need custom programs to operate the equipment they are installed in. Programs are custom written by the user for each application. For chiller or tower systems, Advantage writes a custom program or uses an existing program written specifically for the equipment. A copy of the program is sent with the manual for the equipment when it is shipped. Programming changes can be made in the field using a notebook computer interfaced to the PLC. For more information about Pump Tank Stations and Pumping Systems call the Advantage Sales Department at 317-887-0729. Would you like to Download FYI #239 to your browser?